Mike Conley's Tales of the Weird: Was 'Other Roswell' Real or Hoax? More than 60 years ago this month, a mysterious craft supposedly landed in the New Mexico desert and the bodies of the dead alien occupants were recovered by the military. The weird incident is said to have happened a year after the legendary UFO crash at Roswell, N.M. Today, both UFO researchers and skeptics debate what really happened in what has become known as the state's "other Roswell." In 1950, columnist Frank Scully published a best-selling book called "Behind The Flying Saucers." In his book, Scully wrote about an alien spacecraft which landed without damage on March 25, 1948 near the town of Aztec, N.M. According to Scully's book, the UFO landed in Hart Canyon, about 12 miles northeast of Aztec. The strange metal disc-shaped craft was 99.99 feet in diameter and its exterior was made of a light metal resembling aluminum. However, it was so strong that no amount of heat could damage it. The book claimed that the military used heat of up to 10,000 degrees Fahrenheit on the metal and it had no effect at all. A diamond-tipped drill couldn't make a dent in it either. The weird craft had no rivets, bolts, screws or any signs of welding. The military investigators who arrived on the scene were able to get inside the craft through one of its portholes. Once they opened it, they were able to find a knob inside which they pushed. It caused a hidden door to open up. Inside the UFO's cabin, the investigators were startled to find the bodies of 16 small humanoids, ranging in height from 36 inches to 42 inches. The dead aliens' bodies were charred to a dark brown color. Scully was told by his sources that the UFO landed in the desert undamaged. It apparently was self-guided. 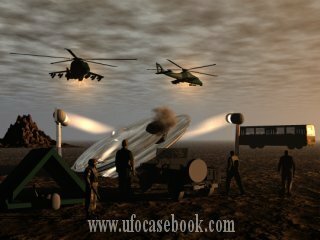 The military was eventually able to take the UFO apart when investigators found it had been put together in segments. The complete cabin, measuring 18 feet in diameter, was lifted out of the base of the UFO. The segments and the alien bodies were then transported with utmost secrecy to Wright-Patterson Air Force Base in Dayton, Ohio. This is the same place where the alien bodies from Roswell were supposedly taken. Some believe that Hangar 18 at Wright-Patterson contains or perhaps once contained wreckage of a crashed UFO, according to a Web site. Scully's book also states that some of the alien bodies were later dissected and examined by the Air Force. According to one report, the bodies were described as averaging 42 inches in length and having an average weight of 40 pounds. They had large heads, large "slanted" eyes, small noses and mouths. The arms were long and slender and reached the knees. The hands had long and slender fingers with webbing in between them. The bodies had no digestive or gastrointestinal tract and no reproductive organs could be found. Instead of blood, the bodies contained a colorless liquid. As for the UFO, it had an instrument panel with several buttons and levers decorated with hieroglyphic-like symbols. The control panel had drawers that opened up but no wiring could be found. Scully's account of the UFO crash near Aztec, N.M. was based on two informants, Silas Newton and Leo Gebauer. Those who are skeptical of the whole thing say that these two men perpetrated the hoax and conned Scully into writing a book about it. Newton and Gebauer were involved in oil exploration finance schemes and they somehow perpetrated the hoax to get investors. The two men claimed to have built a machine that could find oil and natural gas deposits using alien technology, according to a Web site. One of their victims, Herman Glader, a millionaire from Denver, Colo., pressed charges against the two men and they were convicted of fraud and other related charges in 1953. They had allegedly sold him a "tuner" for more than $18,000. It was actually a device that could be found at any hardware store for about $3.50 at the time. But some UFO researchers believe that there is a grain of truth to the story and feel that it was not a hoax after all. Meanwhile, the people of Aztec, N.M. noticed how Roswell capitalized on its UFO legend. Like Roswell, the town of Aztec now holds its own UFO festival to draw tourists. Contact Mike Conley at 652-3313, ext. 3422 or e-mail nconley@mcdowellnews.com.